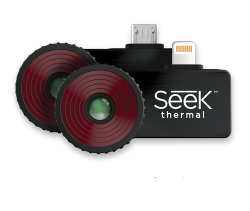 Advanced thermal imaging camera designed for your smartphone. Made for iPhone® and Android™ top models, this highly-portable thermal imaging camera features a large, 320x240 thermal sensor with high sensitivity and a wide, 32-degree field of view. Offering adjustable thermal span, level, and emissivity settings, the CompactPRO delivers unprecedented high-resolution thermal imaging and software capabilities .